Every year, the Guia Circuit plays host to the spectacular Macau Grand Prix. The street circuit is ranked by many racing drivers as one of the most challenging tracks on the planet and it’s easy to see why. Just like Monaco, the circuit is dominated by narrow streets, no run-off areas and long straights. Make one mistake, and you’re in the wall. 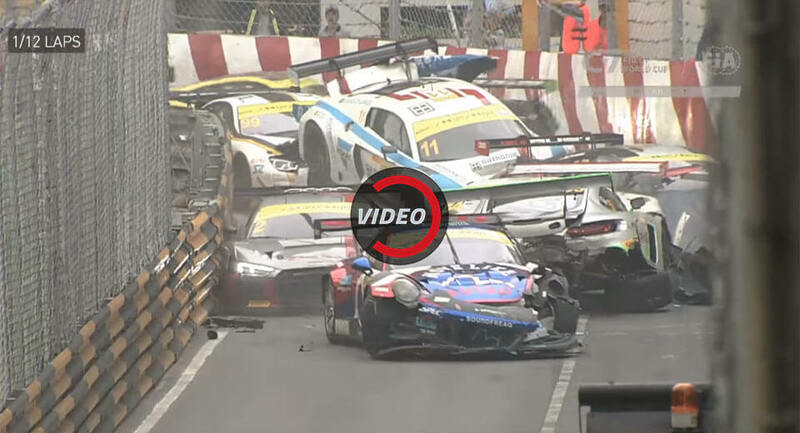 During the FIA GT World Cup event at the circuit this weekend, 16 of the 20 cars in the race were forced to retire after being involved in a massive pile-up. Footage of the crash shows a Mercedes-AMG GT3 car in fourth position understeering into a tire barrier. The car immediately behind him, another AMG GT3, managed to drive around but for the other 15 cars behind, a crash was unavoidable. Following the incident, officials were forced to red flag the event for over an hour. When the race resumed, four of the cars involved in the crash were repaired and joined the four lucky drivers to avoid the carnage.